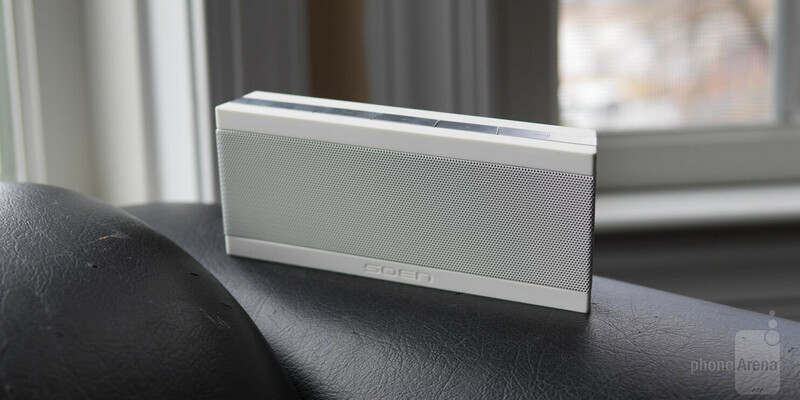 We’ve seen and covered plenty of portable Bluetooth speakers in our time. Some good, some bad, and a lot that we’ve forgotten about because they’re so conventional – both on the functional and design sides. So what makes Soen Audio’s Transit XS unique and different from all others we’ve got our hands on? Well, out of everything, it’s a portable Bluetooth speaker that’s probably most notable for featuring a standard ¼” tripod mount. Visually speaking, it the Transit XS clearly looks very much like your standard portable Bluetooth speaker, but it’s nice to find that it’s truly compact – so much so that it’s the kind of thing that we can fit in our back pocket. Going with a wedged shaped design, one that utilizes distinctive hard lines, the entire casing has a soft touch finish that gives it a clean look. Obviously, the material gives it some splash resistance, but it’s not something that’s fully waterproof, so it’s not the kind of thing you’ll be dipping or throwing into the pool. Most of its façade, naturally, is occupied by the speaker grill – while its volume up, volume down, option button, power switch, 3.5mm audio input, battery level LEDs, and microUSB port are found around its sides. Soen attempts to deepen the Transit XS’ functionality by offering several different accessories at various price points. For example, it’s undeniable that they’re marketing it as the perfect companion for bike riding, as the bicycle mount allows it to be properly fastened. And considering that there’s a standard ¼” tripod mount on its underside, it’s already compatible with an assortment of existing mounts and accessories – like the GorillaPod. Pairing it to a mobile device is made easier with those outfitted with built-in NFC, seeing that hovering the device over the NFC tag on the top side of the speaker initiates the connection. In our experience, we’re able to retain a connection for up to 20 feet before it starts to show signs of degradation with its stability. In terms of its audio quality, we’ll certainly say that it emits a pretty clean tone, which is aided by the subtle bass tones from its patented Soen Momentum Port. However, its volume output is rather underpowered in our opinion, so it’s something that doesn’t really cover distances that well, which we don’t find ample for using while on a bike. Indeed, it’s good for closed or confined spaces, but it just doesn’t have the reach for open areas. Plastered with a sticker price of $129.95, it’s definitely up there in terms of price point when we factor in its overall size. Very recently, we reviewed another comparable speaker, the Samsung Level Box Mini, which comes in cheaper at $100. Both speakers clearly have their attributes, but their volume outputs are equally the same. Essentially, what you’re paying extra here is for the superior water resistant construction and ¼” tripod mount. If they’re something you prize, then the extra cost will be more than validated. If not, then think about the other alternative to save yourself some money. Is this a mini lunch box?